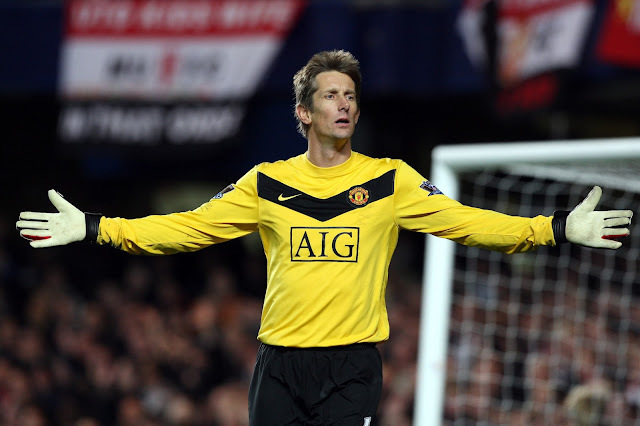 Eight years removed from his last appearance for the Dutch national team and about six seasons since officially retiring from football, one of the great goalkeepers of our time Edwin van der Sar is back in goal, this time with 4th tier Dutch club Voetbalvereniging Noordwijk. But the former Dutch international is unlikely to stick around for too long, as the 6 ft 6" skinny man is simply helping the club who lost their first choice keeper Mustafa Amezrine to injury. Based in Noordwijk, South Holland, the club is in a neighboring town to van der Sar's birth place of Voorhout and the club itself is the last of van der Sar's youth teams before moving on to play for much bigger name organizations such as Ajax, Juventus, Manchester United and a stint at Fulham that I find odd to this very day. At 45 years of age Edwin made his presence felt immediately as he saved a penalty shot in his out "out of retirement debut" on March 12, helping his new club to a 1-1 draw against club Jodan Boys.